Households and businesses throughout France have been left without power as part of a strike by union workers against the country's controversial labor reform. It comes as demonstrators hit the streets to voice their opposition to the legislation. Power cuts in Saint-Nazaire led to some 120,000 households being left without electricity just after 11am local time on Thursday, BFM TV cited Loire-Atlantique prefecture as saying. Electricity was also shut off at the town hall of Tulle, and over 1 million homes in the Paris region were switched over to a low-cost power supply, Reuters reported. It comes after members of the CGT union at 16 of France's 19 nuclear plants – which provide the majority of the country's electricity – voted for a one-day strike Wednesday. Along with addressing sector-specific demands, the strikes and power cuts are aimed at protesting a much contested labor law reform forced through by President Francois Hollande's Socialist government, which will make it easier for employers to hire and lay off workers. Almost half the country's rail services were also brought to a halt on Thursday. The CGT said its workers briefly halted departures from the Gare de Lyon station in Paris by occupying the rail traffic control office. Dock workers also joined the movement in the northern French city of Le Havre. But union workers weren't the only ones voicing their disapproval of the labor reform law on Thursday. Ordinary citizens across the country also organized protests against the legislation. Five policemen were injured during clashes with protesters in Toulouse and two people were arrested, according to the local prefecture. Demonstrators in the city blocked an exit on the ring road, La Depeche reported. Reporting from Paris, RT's Anastasia Churkina tweeted that protesters were gathered in the French capital and will soon organize a march. Protesters also marched the streets of Nantes, with photos on social media showing the remnants of paint bombs. A video posted online also showed objects being thrown at officers in Nantes. Flares were set alight in Bordeaux, where around 600 people reportedly turned out for a march to Place de la République. In Marseille, protesters marched through the streets with banners and flags. 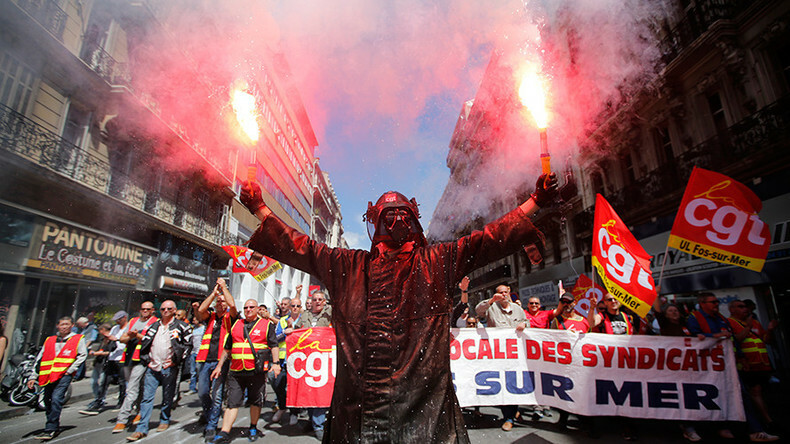 Demonstrators in Rouen were also armed with flares as they paraded the streets. But despite photos and videos posted online which purport to show violent demonstrators, anti-labor law protester Franck Niles told Sputnik France that the situation isn't always as dangerous as it seems. “Some police officers said that this year they were told not to prevent hooligans from getting involved. When they see such groups, they let them mingle with the peaceful protesters, and they only step in after the hooligans start smashing windows everywhere and the TV crews capture those images. So it’s easy to portray the demonstrations as violent,” Niles said. “What is happening right now is unacceptable. I have to wear a hat for protection. I use a handkerchief and lemon juice to protect myself from tear gas,” he said. Niles also said that protesters are particularly upset with the labor law, because it was drafted by the Socialist government of Francois Hollande. “Before we had a right-wing government which took similar measures because it was part of their program. But now we have a socialist government which does not actually follow its left-wing agenda. Everyone who voted for them feels betrayed,” Niles said. The government says the labor reform legislation is aimed at deregulating the labor market and lowering the country's unemployment rate, which is hovering at 10 percent. Those who oppose it, however, say it will make it easier and cheaper for employers to lay off workers. Hollande has rejected demands to scrap the bill.